Coach Kalani Sitake says he wants the team to coach and play aggressively, but he’s not really doing that himself. Provo • Six weeks ago, against Wisconsin, Brigham Young University rushed for 191 yards, averaging 6.8 yards per carry in a satisfying 24-21 win over the Big Ten power known for its stout defense and dominant line play. Tanner Mangum was sacked twice. 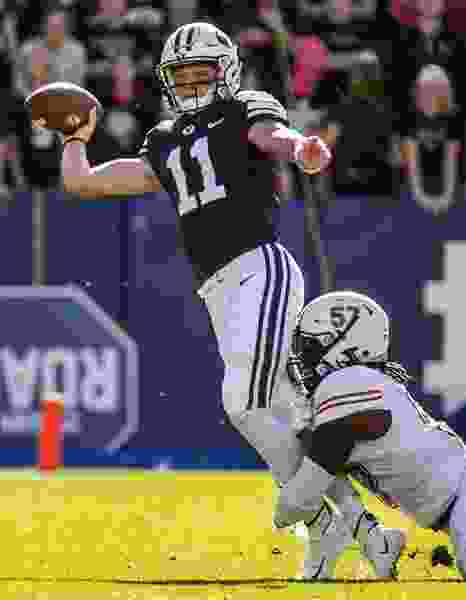 On Saturday, at LaVell Edwards Stadium against lesser-known Northern Illinois, with mostly the same personnel on the field, the Cougars rushed for just 93 yards, averaging 2.5 yards per carry, in an embarrassing 7-6 defeat. Zach Wilson was sacked five times. What happened to BYU’s offensive line? There was plenty of blame to go around Saturday, but most of it should fall on that unit. The line that was praised mightily after the win over No. 6 Wisconsin not only failed to protect Wilson adequately but was manhandled by NIU’s defensive front and committed several penalties at key moments. Sitake said he was trying to get a timeout before at least one of the plays. • Sitake says he wants to be aggressive, but that message isn’t getting through to some of the other coaches, or perhaps even to himself. In the loss to Utah State, defensive coaches were blamed for not bringing enough pressure. In the loss to NIU, offensive coaches were blamed for conservative play-calling and not throwing to the sticks or beyond on third down. Punting on fourth and 4 with less than three minutes remaining was also a less-than-aggressive decision. • Getting bowl eligible is no longer a sure thing. The Cougars beat McNeese to improve to 3-1 and garner a No. 20 national ranking, seeming like a sure thing to get to six wins and bowl eligibility after missing out on postseason play last year. But they will be huge underdogs in two of their final four games — at Boise State and at Utah. • BYU misses Moroni Laulu-Pututau. The tight end position is a big part of the Cougar offense with Matt Bushman and Dallin Holker. But MLP was a much-needed playmaker — remember the touchdown catch against Wisconsin? — before suffering a season-ending injury early in the Washington game. The Cougars also played without starting safety Austin Lee, who wasn’t 100 percent healthy but should be able to play this week. Don’t laugh, but punter Matt Ference was a big part of Northern Illinois' win. Saturday’s game turned into a field position battle, and Ference delivered nine punts for a 46.8 average. He pinned the Cougars inside their 1-yard line midway through the fourth quarter and then flipped the field on his last punt, which traveled 56 yards after the Cougars had sacked NIU quarterback Marcus Childers at his own 15. After the Cougars took over at their 33, all they needed were a couple of first downs to get into field goal range and potentially win the game. But, with a minute and 39 seconds to go, Northern Illinois safety Mykelti Williams ended the threat by stepping in front of Wilson’s pass at the NIU 48 and returning the interception into BYU territory. Ball game. Of course, next week is no normal week. The Cougars play the Broncos at Boise State on the blue turf of Albertsons Stadium on Saturday at 8:15 p.m. BYU is 0-4 at BSU, having lost three close games there, and one lopsided affair.